Amos ’N’ Andy was the rare representation of black culture on 1950s TV—but at what cost? Todd VanDerWerff: Amos ’N’ Andy is one of the most important pop-culture items in the history of the United States. Indeed, the popularity of the radio version made it possible for the form to evolve into the American sitcom, which has proved ridiculously successful. (The first sitcom was likely Sam ’N’ Henry, a forerunner to the Amos ’N’ Andy radio show from the same creators, Charles Correll and Freeman Gosden.) And yet Amos ’N’ Andy is the rare controversial TV program that’s maintained its allure of controversy for more than 60 years since its initial broadcast. The reason for that is simple: It relies extremely heavily on racist stereotypes that we’ve since realized are harmful. The question of representation is a difficult one to answer. The primary argument in favor of Amos ’N’ Andy is that it depicts a richly textured Harlem community at its center, filled with all manner of black people, filling all manner of occupations and roles. White characters were an unusual occurrence, and every one of the major regular and recurring characters was played by a black actor. In the central roles of Andy and the Kingfish, Spencer Williams and Tim Moore are fine and funny indeed, finding the humor in some very broad material. (Though his name is in the title of the show, Amos has essentially become a supporting character in the story by this point, reflecting the way that popular newspaper comic strips would eventually be hijacked by former supporting characters who became more and more popular—see also: Barney Google And Snuffy Smith.) The TV series’ Harlem is a place that comes to vibrant life each week, filled with a panoply of characters from all walks of life. When Amos ’N’ Andy was airing, it was essentially the only place on American television to see black people at all; the next popular sitcom with a majority black cast—Sanford And Son—wouldn’t arrive for nearly two decades after this show’s cancellation. 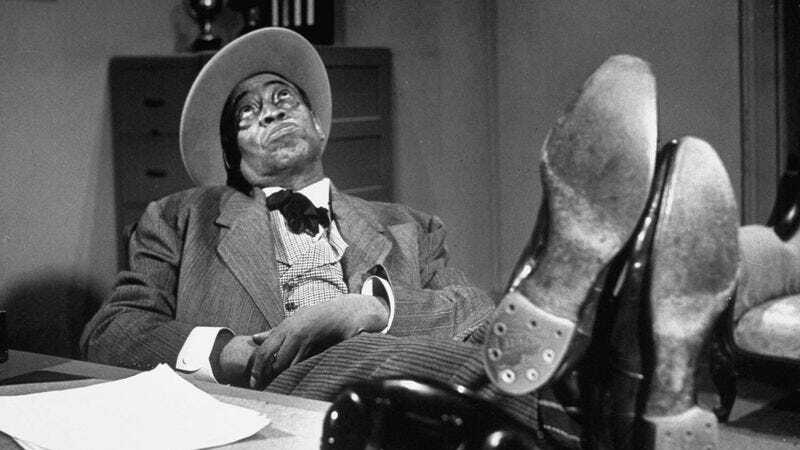 Much of the controversy surrounding Amos ’N’ Andy actually stems from the radio show. Correll and Gosden were white, and they used their facility with doing voices based on popular types from minstrel shows to fill Amos ’N’ Andy with characters that created a kind of aural blackface (in the words of A.V. Club contributor Gwen Ihnat, who’s an expert on old-time radio and will be joining us for this discussion). Several scholars have made the argument that the world of the show was so fully realized and filled with such interesting characters that Correll and Gosden were far less to blame for the perpetuating of racial stereotypes than many other popular minstrel show-inspired radio programs of the era. After all, on the radio, race can’t be seen, and both men seemed politely embarrassed by the one film they appeared in as Amos and Andy (one of the few times they’d appear in actual blackface). All of that may very well be true—I’m not enough of an expert on the original radio show to say—but what’s harder to square as a progressive viewer in the year 2013 is that this story is based around harmful stereotypes. Andy is a dumb, shiftless layabout—the first big laugh we get is from him being asleep in bed. The Kingfish is a greedy, two-bit hustler who’ll rig up any scheme to keep his money. And Lightnin’, the kid who helps Andy move into his “house,” is a goofball naïf, whom Wikipedia helpfully describes as “a slow-moving Stepin Fetchit type.” Are there other characters who break free of black stereotypes? Sure, but in this episode, at least, they’re sent to the background in favor of the Andy/Kingfish storyline and Lightnin’s high jinks. Take, for instance, the scene where Andy and Lightnin’ first come to the house he believes he’s bought on the lot Kingfish sold to him. (I’d summarize the plot more, but it’s literally in the title of the episode.) The house is from a movie set, and it’s just a false front. It takes Andy and Lightnin’ forever to arrive at this conclusion, making them seem almost too stupid to believe. Later, Kingfish laments all the money he’s lost when he thinks he has a chance to make a profit on the land, while Andy is fooled into believing there’s an oil well on his property thanks to a hose and some motor oil. Is representation worth anything if it’s primarily being used to prop up the majority’s belief in its own superiority? I don’t think the TV version of this property is as offensive as its reputation—the NAACP got the program driven from the air based largely on the reputation of the radio show in an era when blackface and minstrel shows were rapidly being seen for the offensiveness they contained (though Correll and Gosden as Amos and Andy continued on radio until 1960)—but it would be hard for a show that disappeared from the airwaves because of that controversy and despite its success to be that offensive. If there’s a world where Amos ’N’ Andy opened TV up for black actors and creatives, we didn’t get to live in it. And yet it’s unmistakably an artifact of a time in which it was made, a piece of television that lives in the middle of white America’s unfortunate attitudes about the black people who lived alongside them. I’ve seen too little of this show to state anything about its quality overall definitively, but watching this episode made me distinctly uncomfortable, even as I could see what its defenders see in it. Where did you all fall on that spectrum? And, to your mind, does presenting this many black people to a national audience week after week on television outweigh any harmful stereotypes the program perpetuated? Phil Dyess-Nugent: I’ll be speaking for the defense on this one. I first saw Amos ’N’ Andy in the mid-1980s, when the show, which will never be seen on broadcast television again, started making the rounds on cheap, probably bootleg VHS cassettes. It was around the same time that I first laid eyes on most of the other TV comedies from that period that I love, especially The Honeymooners and The Phil Silvers Show. I think that it’s easier to appreciate the show’s virtues if it’s seen as part of that group, and especially if it’s seen as something apart from the radio show, which was a minstrel-show embarrassment. (I’ve never been able to make it all the way to the end of an episode.) Whether people find Amos ’N’ Andy funny will often depend on their taste for comic broadness. But I think it’s the broadness combined with the show’s lineage, and the bad reputation based on that lineage, that makes modern audiences see something ugly in the characters’ capacity for missing the obvious (which does not usually far surpass that of, say, Ed Norton’s), or the fact that the Kingfish is a scheming con man, much like Sgt. Bilko. In this kind of comedy, performance ultimately makes much of the difference. Tim Moore, like Phil Silvers, was the living embodiment of vaudevillian hamming, and Spencer Williams had a way of suggesting an innate dignity even when he was sniffing the country air and exulting, “Smell that penicillin!” (Williams may be less well-remembered now for playing Andy as he is for having been a pioneering black filmmaker, whose best-known work, The Blood Of Jesus, was added to the National Film Registry in 1991.) It’s worth stressing that Charles Correll and Freeman Gosden were reportedly unhappy with the way their characters were portrayed on TV, and during a rare visit to the set, even tried to instruct Spencer Williams on how to play a black man. The show’s real problem was that, as the only representation of black life on TV at the time, it was asked to carry a weight that would never be put on, say, the Wayans brothers or the cast of Real Husbands Of Hollywood. I’m not aware of any mass outcry to drive the money-grubbing, tricky Sgt. Bilko or the miserly Jack Benny off the air, and keep them off the air for all eternity, because they presented an unflattering image of Jews. But then again, there were other Jewish actors on TV, playing different kinds of roles. The only place where viewers of the 1950s could go, week after week, to see depictions of responsible, professionally respected black characters on TV was… on Amos ’N’ Andy, where such characters tended to show up whenever a straight man was needed to stare in disbelief at these idiots. (And the show had an extraneous straight man built in thanks to the inclusion of Amos, whose dullness pretty much excluded him from taking an active role in most of the stories.) The Amos ’N’ Andy Show stuck out at the time because there was nothing to contrast it against. I think that Moore and Williams were dancing. (I’m on the fence about Lightnin’, whose sleepy-eyed, slow-moving characterization is more in the Stepin Fetchit tradition—though, 20 years later, Whitman Mayo got away with doing basically the same act as Grady on Sanford And Son. Maybe the grey hair makes all the difference.) And I think it’s a shame that the most high-profile work they ever got to do as actors, and the work of their cast mates, has to stay locked away in the vault, for the good of society. Questionable images of African-Americans run throughout popular culture of the 20th century, some of which—like the rubber-lipped ink spot that Will Eisner called a black character in The Spirit—remain uncomfortably embedded in major, enduring work. It’s as if a sacrificial victim was needed before we could all move on, and Amos ’N’ Andy was in the right position to take the bullet. Gwen Ihnat: For a little more context on why we’re still discussing Amos ’N’ Andy nearly a century after the original characters were created: What Milton Berle and Sid Caesar were to television, Amos ’N’ Andy were to radio. As Todd mentions, Freeman Gosden and Charles Correll’s creation (they initially performed all the characters and wrote all the scripts) was the very first broadcast program to develop a continuing storyline and characters, which was hugely popular with Depression-era audiences. Social workers in the ’30s found that people were willing to sell their mattresses and their refrigerators before they’d get rid of their radios, which provided entertainment, escapism, and really the first virtual community for an extremely down-on-its-luck population. And Amos ’N’ Andy, despite our feelings about the show today, resonated with these audiences partly because they seemed even poorer than the listeners themselves. The show was broadcast nearly every day, and restaurants and movie theaters found they had to broadcast the show over loudspeakers if they wanted to keep their customers. The saying went that you could walk down any American street and hear the entire Amos ’N’ Andy broadcast without missing a line—by listening to the program through the windows. When Amos ’N’ Andy started a bank on their program, the radio station was flooded with dollar bills sent in from listeners—in the middle of the Depression. So as many radio shows made the jump to the new medium of television in the ’50s, it was a kind of a no-brainer that radio’s longest-running comedy would also transition to TV. I say “kind of” because at least by this point the show’s creators realized that the aural blackface was not going to go over in the visual realm. So Gosden and Correll introduced the new cast, African-American actors to play the now-familiar characters like Amos, Andy, Kingfish, and Sapphire. The NAACP protested the new show almost from the start, complaining about the negative racist stereotypes the show depicted, and it only lasted a few seasons. In the Amos ’N’ Andy: Portrait Of A Controversy documentary, African-American stars like Marla Gibbs (The Jeffersons, 227) and Redd Foxx comment that they loved the television show growing up. The characters were funny, and as Phil points out, it was the only program in which the black race was featured on TV in anything other than servitude. The NAACP’s point was that it was the only depiction of African-Americans at that time. I agree with Phil that the show actually had a lot in common with The Honeymooners (strong female characters married to less-than-intelligent husbands) and other sitcoms of the era. And it did feature the occasional inspired scene, like Amos tucking in his little girl while explaining the Lord’s Prayer to her. I find “Kingfish Sells A Lot” interesting because with the fake house, the episode contains a lot of visual humor, a new arena for a show that started on radio. Also, Sapphire (Kingfish’s wife) gets a powerful scene: Even though most of the men on the show were portrayed as idiots, the women never were. By this point, pretty much all Amos ’N’ Andy plots involved Kingfish trying to swindle Andy out of something, so Andy’s double-cross at the end offers some gratification. But if I could watch this show in a vacuum, would I seek it out? Probably not. Its antics aren’t that much funnier or more creative than others from the era (I’m a Jack Benny girl, myself—more character, less slapstick). I feel the same way about the radio show; I appreciate how it furthered the popularity of the medium, but I would never listen to Amos ’N’ Andy if there was anything else available to listen to (and there always is). Without the vacuum, the racist stereotypes are still too painful to ignore; fortunately, from today’s standpoint, they seem almost incomprehensible. Ryan McGee: Given what’s already been thoroughly covered by everyone thus far, I am not sure I have too much to add in terms of episodic analysis: The installment is a narrative as thin as the façade that Kingfish sells Andy, and everything related to the stereotypes on display has been brought to light already. So let me turn to what really fascinates me about bringing this program into the Roundtable: how it highlights the type of controversy that time simply can’t erase. To this point, we’ve dealt with enough historical distance from the initial airing to have a fundamentally different reaction than initial audiences. Since we don’t live in the height of the Vietnam War, The Smothers Brothers’ brand of comedy doesn’t have quite the same bite. Since we don’t live in England at the height of pedophiliac paranoia, Brass Eye’s “Paedogeddon!” doesn’t have quite the same impact. But there’s no distance we can really have as viewers now that softens the blow of not only what’s onscreen in Amos ’N’ Andy, but everything that went on around it. In college, I studied a literary theory known as “new historicism,” pioneered by critic Stephen Greenblatt. In essence, new historicism looks at primary works (mainly literature) through the prism of the cultural forces that helped shape it: newspapers, pamphlets, and elements “non-literary” in nature as well. In short, everything informs everything. Rather than look at any TV show as an isolated piece of entertainment, it’s imperative in the new-historicism model to look at all external elements that may have crept into and then reflected back within that show. That’s an incredibly reductive way of looking at new historicism, but it nevertheless highlights why Amos ’N’ Andy is so often overlooked and/or dismissed, and why it’s so great that Todd decided to shine a light on it this week. The flipside to saying how remarkable it is that this show existed at all is to note how monochromatic the rest of the television landscape was. On top of that, it’s necessary to look at all the external cultural factors already laid out by the other Roundtable members. Furthermore, it’s equally remarkable now how we’re still not only faced with the overwhelming percentage of Caucasian actors in television shows, but an overwhelming number of Caucasian critics discussing them. It’s easy to look at “Lucy Is Enceinte” and laugh about how worried network executives were about incorporating Lucille Ball’s real-life pregnancy into the show. But it’s not any easier for us to watch “Kingfish Sells A Lot” now, even with decades separating its initial airing and our viewing. In fact, the experience of watching it is so overwhelming that it’s easier to simply ignore the show rather than confront the ramifications it presents. To look at Amos ’N’ Andy now doesn’t provide comfort in knowing how far we’ve come. Rather, it reinforces how little progress has been made. There’s plenty of controversy to be mined inside the episode presented this week. But the controversies that still exist out of frame are the ones that this week’s discussion truly brings to mind. It’s really hard to look at this show not because of the content of the episode, but what it suggests about the status of the culture that helped usher in its existence in the first place. For all the distance discussed in this phase of the Roundtable, this one hits awfully close. The other side is that things that used to be okay aren’t anymore. And it’s the passage of time that renders them less and less okay, as the social attitudes that allowed them to be public, open, and mainstream recede farther and farther into the unenlightened past. The question is whether we will ever get far enough past the problematic history of representations of race in America to see both the insensitive stereotypes and our prudish horror at such as equally quaint, where we can look at both objectively. The way racist (or quasi-racist, or unfortunate, or stereotyped, or has-been-used-for-racist-purposes) material has been scrubbed from the marketplace feeds into the New World Order conspiracy fears of resurgent conservatism. It perpetuates a conviction in a large swath of Americans—trust me, I live among them here in Arkansas—that there’s a small group of elites who have decided what’s good for the rest of us and what has to be taken away from us lest there be any risk of offense or mixed messages. And the backlash from that paternalism leads people to grumble loudly, as they do in the YouTube comments on this episode, that the bad ol’ days were really pretty sweet, and that we’d be in a lot better shape in this country if we watched good wholesome maybe-racist caricatures instead of having men kissing each other all over the place. If you’ve had your parents or grandparents complain about Song Of The South being unavailable and how there was nothing bad in it, raise your hand. One reason this material is not available on the open market is fear that regular commercial airings or sales would occur in unpredictable contexts. It’s not like it’s impossible to imagine a home for it in the 21st century: Rejoice! TV, a Houston broadcast channel (now web only) with an “urban gospel” orientation, has been airing Amos ’N’ Andy since 2012, claiming both that it’s their most popular programming and that they’ve received no complaints. That seems credible, given the channel’s mission and audience. But nobody wants to see material that could perpetuate discredited, regressive attitudes being used indiscriminately to sell soap or Viagra. I don’t think you need a university classroom and a primer on representation around Amos ’N’ Andy, the way you do around some truly racist, disempowering, and dehumanizing chapters of filmed entertainment. The stereotypes are really stock comic types (snake-oil salesman, credulous mark), and it’s mostly the history of how those venerable joke-generating characteristics got inextricably mixed with skin color, dialect, and marginal cultures that makes us uneasy. I hope that one day we’ll be able to watch Amos ’N’ Andy like I read my daughter the 1930s run of Little Orphan Annie today, so unaware that Chinese people were once exoticized and stereotyped that Daddy Warbucks’s pidgin-spouting ally Wun Wey is just a character pointing to a distant, less cosmopolitan past, when most people didn’t come into close contact with Asians and therefore filled in the blanks with pure flights of fancy. I tell her about how the people who read those strips in the newspaper thought of Chinese people with limited, stock images—rice paddies, laundries, Charlie Chan, and “Confucius say”—and how we now live in a country where she goes to school with children of Chinese descent and has a chance to get to know them as individuals who aren’t all the same. “We’re so lucky,” she always says at the end of these talks about how things used to be. We are. And maybe with time, we’ll turn that corner where we can embrace these parts of our past. Those future people will be even luckier. David Sims: I speak on Amos ’N’ Andy from a position of utter ignorance. This is the first time I’d ever seen it—in fact, I don’t think I’d even heard of it until seeing the film Chicago in 2002 and not getting Richard Gere’s running joke of calling John C. Reilly’s character Andy instead of Amos. My mother had to explain that one to me, and then uncomfortably explain the history of the show. But clearly I didn’t pay enough attention, because when I watched this episode I was surprised to see black actors playing every role. That’s probably a mix of my understanding of the history of the original radio show and my general concept of how racist television could be. I grew up in Britain, a country with a generally evolved reputation that still put stuff like this on TV as late as 1978. So, weirdly, I expected a bunch of white actors in blackface and instead was confronted with what seemed to amount to a very broad sitcom—one starring black actors and set in Harlem—that trades on every stereotype possible. But I was still weirdly impressed that a show about black families and business owners was even on TV in the 1950s. Which shows how poorly I think of our past as a country. Considering that this is still a culture that often compartmentalizes “urban” movies and TV shows for a specific audience, often on specific channels, I guess I couldn’t dream that CBS would be airing such a show, even though it’s very, very uncomfortable to watch. I understand what Phil is saying, that every character is fitting to an archetype, but it still left me feeling hot under the collar. I love your point, Donna, that maybe one day these things will feel so distant to a generation that they can watch Amos ’N’ Andy and really regard it as an artifact. I’m unsurprised I didn’t have that reaction, though. As Ryan said, there’s still a lot of progress that needs to be made.